Among Hispanic adults in 2012, 49.8% were born in another country, down from a peak of 55% in 2007. Among all Hispanics, the share foreign-born was 35.5% in 2012, down from about 40% earlier in the 2000s. Between 1980 and 2000, immigration was the main driver of Latino population growth as the Latino immigrant population boomed from 4.2 million to 14.1 million. 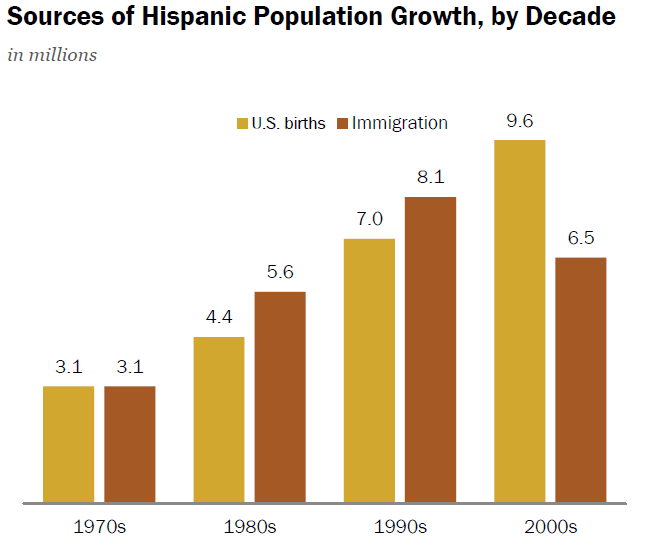 However since 2000, the primary source of Hispanic population growth has swung from immigration to native births. Between 2000 and 2010 , there were 9.6 million Hispanic births in the U.S., while the number of newly arrived immigrants was 65 million. Overall, U.S. births alone accounted for 60% of Hispanic population growth (births and immigration only) during the period. Previous NYC: Now You Can Find Out If/Where You/We… Fit in the NYC Poverty Measurements in 2014 and Why!